Hundreds of people showed up to support the Brooklyn neighborhood event. 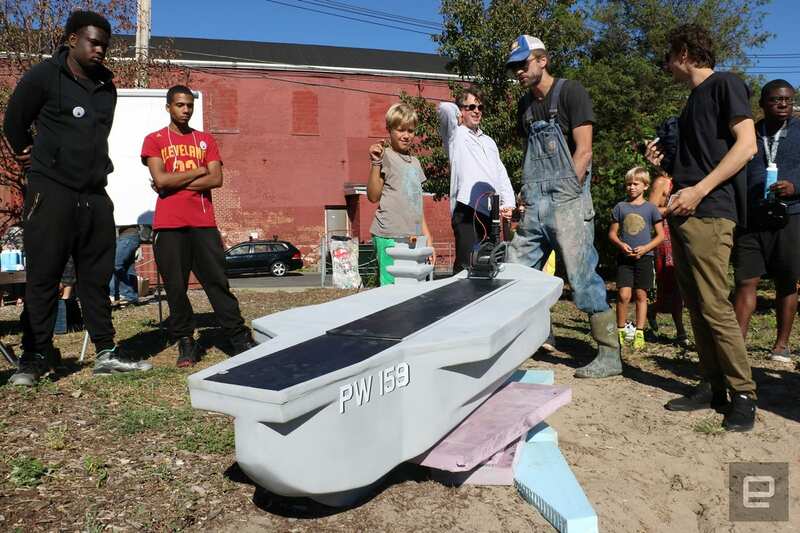 Last Sunday, nearly 500 people gathered at Valentino Pier in Red Hook, Brooklyn, to cheer on close to 20 radio-controlled boats as they sped toward a target 150 feet away. 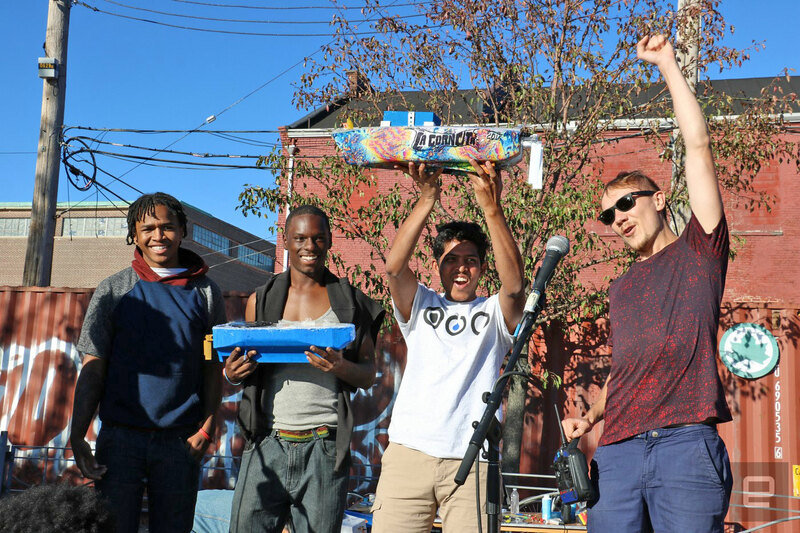 The boat races were part of the second annual Red Hook Regatta, which was born last year as a means to highlight the area's history as a freight port, as well as the work of local youth. 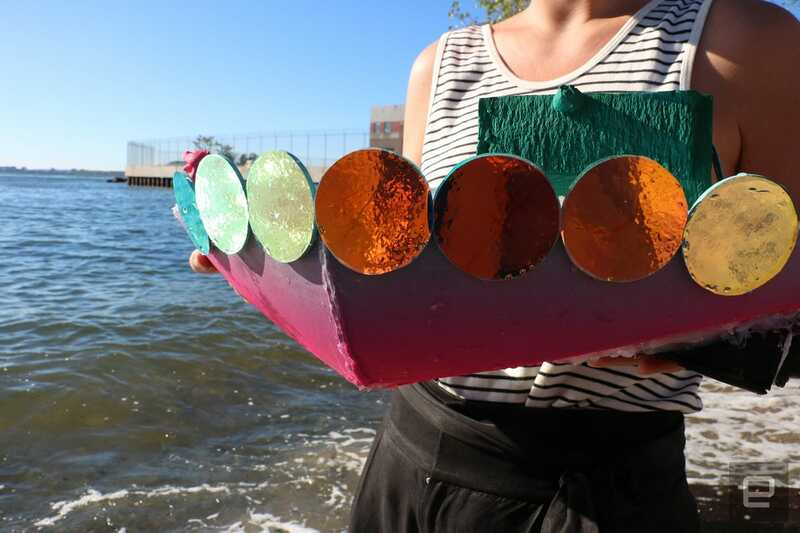 The competing vessels, which were either handmade or 3D-printed, were created to showcase the expertise of Red Hook's so-called Digital Stewards. The Digital Stewards fellowship is part of the Red Hook Initiative, a nonprofit that was founded in 2002. The yearlong program gives local youth free training in technology, digital media and skills such as 3D modeling, web development and WiFi architecture. It also includes a paid three-month internship. In the fellowship's last two generations, the Stewards have been learning how to create 3D models and design boat hulls that had to be watertight. After completing their masterpieces, two of the fellows, Laurenzo Reed and Jesus Benitez, felt that there needed to be a celebration at the end of the program to showcase what the Stewards had been doing, especially involving 3D printing. Event organizer David Sheinkopf thought it was a good idea. He said he had wanted to do a 3D-printed boat race for a while, because he thought "everyone would love it" and it would be a good opportunity for education about and exposure to tech. Sheinkopf co-directs the education and tech-integration arm of Red Hook–based nonprofit foundation Pioneer Works. He's been working with the Digital Stewards for three years now, and recently received a grant for the organization to integrate civic journalism into their programs. That led him to research the area's history and talk to older members of the community. He learned that about 10,000 people lost cargo-related jobs in the 1950s, when the local shipping industry made the move to container stations. 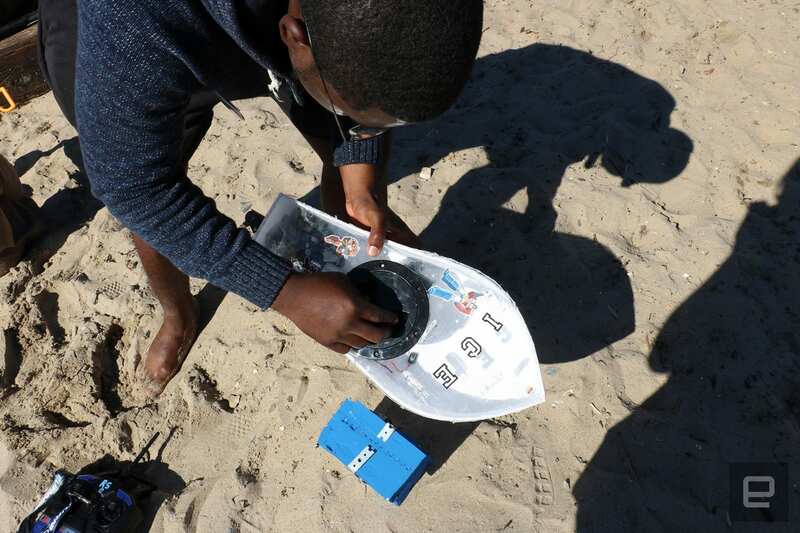 And so, to tie the historical relevance to the modern technology that the community's youth were learning in the fellowship, the 3D-printed boat race was born. This year, three main events anchored the regatta's program: a first-ever homemade (non-3D-printed) boat race, a halftime show and a 3D-printed boat race. Each vessel had to fit within a two-by-two-by-two-foot box, and was equipped with a motor and a rudder. About 14 teams competed in the 3D-printed category, compared with just four for the DIY, and each team consisted of a captain and a stevedore (a cargo loader). The captain was in charge of steering the boat toward two magnet-equipped fishing hooks at stations about 150 feet out in the water, while the stevedore's duty was to load the boat with foam bricks. These had metal attachments on them so they could easily be picked up by the hooks. One of the competing vessels heading back to shore after offloading its cargo. The goal of the race was to send your vessel, loaded with one foam brick at a time, to one of the hooks. You'd score a point if your boat delivered a brick to the nearer checkpoint, and two points if your cargo got picked up at the station farther out. Then you'd have to steer your boat back to the coast to get another brick and head back out to the hooks. The team that scored the most points within 15 minutes won the race. I joined former Digital Steward Robert Smith this year as the stevedore to his boat (which he named Ice Kingdom). The white, almost grandfather-clock-shaped hull was slightly over a foot long and about five inches wide. A laser-cut piece of plastic that covers the hull was the only part of the boat other than the motor and transmission (provided by the event's organizers) that wasn't 3D printed. The hull was covered to provide a platform for the foam bricks, as well as stabilize the ship. On Smith's boat, this plastic covering had some Transformer stickers as well as the letters ICE. "Be careful, it's an Autobot," he told me. Small parts of the boats, such as rudders and rotors, were printed with a Makerbot Replicator 2 at Pioneer Works' lab in Red Hook. The hulls were printed with a Gigabot 2, which has a larger platform and capacity. Smith working on his boat right before we launched it into the water. Up until the very last minute before the race, Smith tinkered with the boat's motor and rudder, tightening wires and ensuring everything worked, while I tried to (trash) talk to some of our competitors. Not all of them were affiliated with the Digital Stewards program. Susse Soenderby and Guri Venstad, who hail from Norway and Denmark respectively, learned of the race through Pioneer Works. Their vessel, a colorful mermaid-esque ship named Frøja, was modeled in Solidworks. The ladies had printed their hull at 3D-printing service 3D Hubs, then painstakingly sandpapered and spray-painted it themselves with a gorgeous blue-green gradient. The result was stunning and looked more like a toy you could buy off the shelf for your Barbie than a 3D-printed project. The gorgeous paint job on Frøja. In the end, although Ice Kingdom and Frøja lost to winners Malachi and La Cornuta, all participating boats performed respectably, and not a single vessel got lost at sea. Ice Kingdom was the first to score a point at all, but eventually had to bow out due to motor failure. Despite many frustrating defeats, people who turned up to show support remained in high spirits. 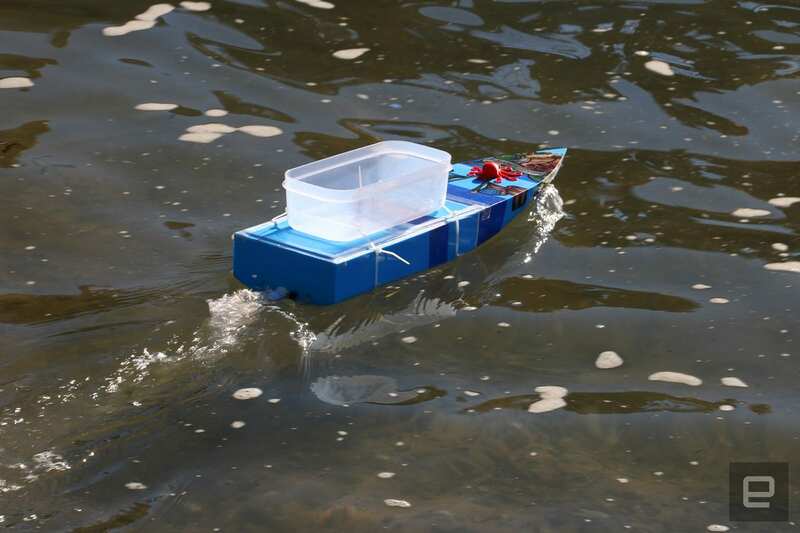 A particularly heartwarming entrant was crowd favorite Garbage Boat, an artistic bag of trash strapped to a motor that competed in the DIY category. Garbage Boat and its maker, Sam Levine, drew loud cheers and applause, even though they failed to score a single point. And the halftime show, which had organizers landing a drone on a homemade six-foot aircraft carrier, was yet another demonstration of tech coming out of Red Hook. The homemade aircraft carrier on standby before the halftime show. Spectators were also treated to a performance by neighborhood children's dance team Flagpole's Finest, and kid-friendly activities were available throughout the day for younger attendees. Sheinkopf said, "Our goal with this race was to have an event that was so inherently interesting and weird and different" that it would attract a truly diverse audience. And indeed, I saw people of all ages, ethnic groups and genders out that day. This level of representation in the turnout was, to Sheinkopf, "a measure of success." And as for what events like this can do for local youth, he believes "just putting these young adults in proximity to all this tech just makes it more real."